The world of childhood nutrition and wellness is riddled with conflicting advice. Whether you are considering baby-led weaning or sleep training, there’s several experts on either side of the coin. And yet, amid the chatter, there is growing consensus around one topic: the importance of the first 1,000 days. The seminal report inspired subsequent studies, which have only underscored the far-reaching importance of this period. “Research has shown that mom’s diet during pregnancy and what the baby eats in the the first one to two years of life can have a long term impact on not only baby’s health, but also food preferences, behaviors and even neural development,” says Nicole Avena, PhD, author of What to Eat When You’re Pregnant, a research neuroscientist at the New York Obesity Research Center at Columbia University and advisor to Yumi, our fresh baby food company. The brain alone goes through phenomenal growth during this period. By age 2, about 80% of the adult brain is formed. During this period more than half of all energy consumed is going to straight to the brain. Several vitamins and minerals play an important part in this development. For example, folate helps close neural tubes early in a baby’s development, while iron carries oxygen to the brain. Unfortunately, it is quite common for babies to be iron-deficient, especially after 6 months of age when they have depleted the iron stores from their mother. Several studies have shown a correlation between proper nourishment and strong academic performance. In one study, children who were well nourished in early childhood were able to enter school earlier and be more productive in school. Cross-cultural studies have shown that well-nourished children also exhibit higher levels of work capacity. Flavor exposure actually begins in the womb and continues as a child begins to eat solids. Studies show that early exposure to a wide variety of texture, tastes and vegetables can reduce fussiness and instill a love of healthy foods later in life. In a 2013 study conducted across three countries in Europe, researchers found that “increasing variety and frequency of vegetable offering between 6 and 12 months, when children are most receptive, may promote vegetable consumption in children.” On the other hand, there is also concern that over-exposure to sweetened foods or drinks during this period will encourage kids to develop a preference for sugary foods. In one of Goran’s recent studies, there was evidence that fructose consumed by mothers was detectable in breast milk and was correlated to an increased risk of obesity for their babies. Guidelines around sugar have also tightened in recent years, with the American Academy of Pediatrics recently declaring that children under age 1 should not have juice. While all the research may feel daunting, mealtime doesn’t have to feel scary. 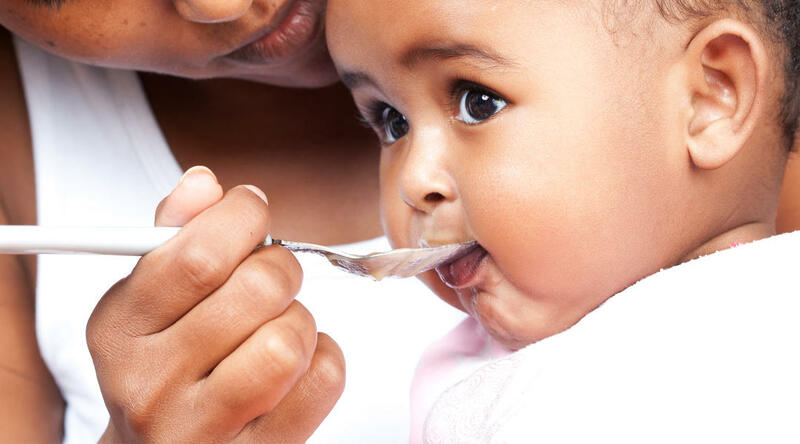 In the first 1,000 days focus on a varied diet for you (during pregnancy and breastfeeding) and your baby when your child transitions to solids. Try to avoid feeding your child too much fruit, and do not give juice before the age of 1. Though whole fruits are definitely better than juice because of their fiber content, a diet too rich in fruits will increase fructose consumption and limit room for other nutrient-rich veggies and proteins. Variety will help you hit nutrients that young kids are typically deficient in, such as iron, and will help kids develop a real love for real food. Evelyn Rusli and Angela Sutherland co-founded Yumi because of the importance of the first 1,000 days and their frustration with the current baby food market. Yumi works closely with nutritionists and doctors to design baby meals that are nutrient dense, organic and low in total sugar. Evelyn is a former New York Times & Wall Street Journal journalist and Angela is a former finance executive and the mother of two young children in Los Angeles. You can follow Yumi at @yumi on Instagram, Twitter, Facebook. You can also join Yumi’s private Facebook group, Yumi: For the Babes, where you can ask questions about parenthood and get exclusive access to our team of experts.